Pete Carroll, who subscribes to one of the more explosive conspiracy theories out there, categorically denies any truth to the conspiracy theory that the Seahawks' desire to make a Super Bowl hero out of Russell Wilson and not Marshawn Lynch led him to overrule the fateful playcall. "There was not a thought about running it, and then I changed the play," Carroll said Monday. "That did not happen." We heard a version of this shadowy conspiracy almost immediately after the game, floated by someone inside the Seattle locker room, and more claims emerged throughout the day. The gist of the theory goes like this: with feet to go for a touchdown and a near-certain Super Bowl victory, the Seahawks braintrust wanted to make sure that Wilson—marketable golden boy, franchise quarterback, company man—would take home the MVP and the fame and the glory. Much better than Lynch, who is in the middle of contract negotiations and could possibly have squeezed some more millions out of an iconic touchdown, and is 28 years old, right around the age where running backs risk falling off a cliff anyway. So, goes the more extreme version of this conspiracy theory, offensive coordinator Darrell Bevell drew up a handoff to Lynch, only for Carroll to change the playcall to a pass. Carroll says that's bunk, and that one pass—maybe even two!—was always the plan. "One of those downs we were likely to throw the ball and maybe two of those downs," Carroll said, "depending on how we had to save the clock to get in all of our plays. It wasn't just run the ball. That wasn't what the thought was." Carroll had said pretty much the same thing on Sunday, that the playcall was a function of clock management rather than of risk management. "I don't ever coach these guys at one time thinking that they're going to throw an interception," he noted yesterday. Even with the slant route the Seahawks called, the game-killing interception required unexpectedly quick thinking and quick reaction by an undrafted rookie corner. But it was still a riskier play than anything the Seahawks have typically called this season in similar situations. The Seattle Times' Jason Jenks examined the 19 plays, prior to Sunday, that Seattle ran from inside their opponents' three-yard-line. Lynch carried the ball 11 times. He scored touchdowns on five of those carries. Wilson carried the ball twice. He scored touchdowns on zone-read plays in which he faked a handoff to Lynch, then pulled the ball back and took off running. He scored untouched both times. Wilson and the Seahawks attempted six passing plays. Wilson completed three of five passes and was sacked one other time for a 1-yard loss. He threw two touchdown passes. One went to Robert Turbin out of the backfield for a 3-yard touchdown, the other to tight end Tony Moeaki after faking the handoff to Lynch for a 1-yard touchdown. That's seven scores on 13 rushing plays, compared with two scores—one of them with play-action—on six passing plays. 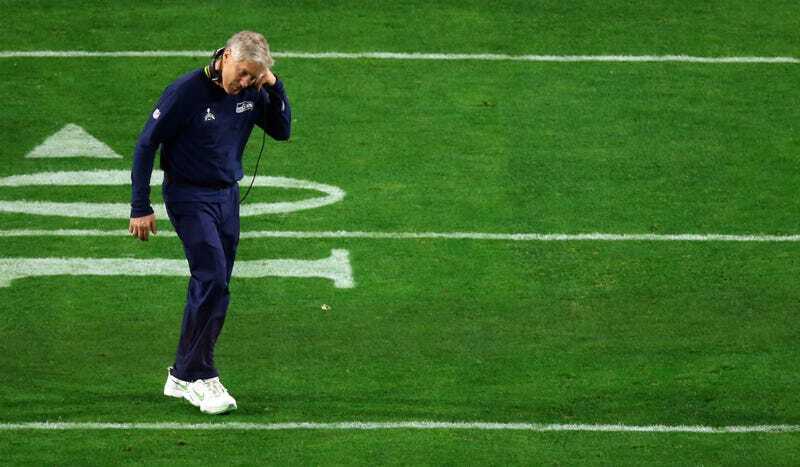 Pete Carroll may not have vetoed giving the ball to Lynch, but when the Seahawks called for a quick slant, with no misdirection or moving parts, they were getting away from what had worked for them all year.